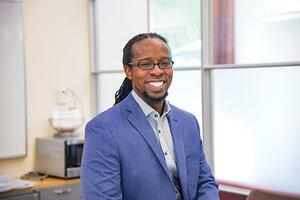 Under the leadership of Ibram X. Kendi, a leading scholar of racism in the United States, the Antiracist Research and Policy Center at American University has positioned itself to become an unstoppable engine of racial change. The center engages in research around racial inequity to dismantle discriminatory policies in the US and abroad. It is founded on a pioneering vision of racial change: to eradicate racist ideas, you must first do away with racist policies. Toward this end, interdisciplinary experts will be employed to execute powerful campaigns for change. Its advent coincides with a major moment in the life of our nation, says Christine BN Chin, dean of the School of International Service (SIS). In February 2018, the center unveiled its first major initiative: FD200. Launched in partnership with Frederick Douglass Family Initiatives, the project commemorates the bicentennial of Douglass’s birth by celebrating 200 people who embody the spirit of his work—as an abolitionist, politician, writer, feminist, educator, entrepreneur, and diplomat. Honorees include Black Lives Matter cofounder Patrisse Cullors, award-winning novelist Min Jin Lee, and Oprah Winfrey. While many people throughout history have dedicated their lives to exposing racist policies and people, the same cannot be said for institutions, says Rachel Lee, the center’s research and communications specialist. When it comes to institutional efforts, many firsts have yet to be achieved, she says, and the center is poised to lead them. In 2019, it will host an Antiracist Book Festival, the world’s first and only event dedicated to literature on racial justice. Kendi announced the inception of the center in 2017 when he joined AU as a professor of history and international relations in the College of Arts and Sciences and SIS. Since then the center has been building its conceptual, fiscal, and strategic foundation. Its unique research model is team based and project oriented. Six teams of experts have been assembled and assigned to focus on one sector of society—economy, education, environment, health, justice, or politics. Each group is tasked with targeting an inequity in that sector that needs to be eliminated, researching the underlying causes of the inequity, and developing a campaign for change.